Houston Therapist: Beverly Walsh - Therapist 77047. Send A Message To Dr. Walsh. Session Fees: Initial 1 hour assessment - $190. Follow up 1 hour session - $170. Are your relationships full of conflict? Uncertainty? Disconnection? Do you find yourself “losing your cool” or “shutting down” when stress comes your way? Would you like to “find your voice” and not shy away from problem solving? Does your child have a hard time fitting in, focusing, and matching the energy of the room? Dr Beverly Walsh, using a holistic approach, works to help people address these and many other issues. Dr. Beverly Walsh, or Dr Bev as most of her clients call her, earned her Ph.D. in Counseling Psychology from Texas A&M University and has been licensed as a Psychologist in the State of Texas since 1996. She has worked in a variety of settings that have included Texana MHMR, Therapeutic Foster Care, Juvenile Probation, Inpatient Substance Abuse Treatment (Teens), and Private Practice. In 2009, Dr Bev experienced a huge shift in her practice and joined the "herd" at Red Dun Ranch in Houston, Tx. 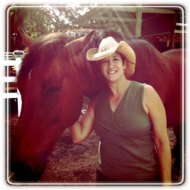 Still offering traditional office-based psychotherapy, she trained and became certified to offer what is known as Equine Assisted Psychotherapy (EAP). In her “outside office”, Dr Bev has the honor of witnessing the powerful breakthroughs and shifts partnering with horses can offer. The Red Dun Ranch "co-facilitators", aka, the herd of horses, offer honest, direct, non judgmental feedback regarding how people approach relationships, challenges, communication, and emotional regulation. Dr Bev is a clinical psychologist who provides Individual, Couples, and Family psychotherapy. Red Dun Ranch is a beautiful 7-acre horse property in south Houston, off Beltway 8 and 288. People immediately are taken with the peacefulness and welcoming nature of the property; noticing the Live Oaks, being greeted by our dogs, smiling at the occasional sighting of the pig "Mud". Dr Bev believes that a connection with nature, the horses, and other animals at Red Dun Ranch fosters a chance to self-reflect and learn to build better, healthier, more "stable" relationships. After you schedule an appointment online, you will receive an email with an "Introduction Packet" that tells you more about Dr Bev's practice. You will also be asked to complete some basic information - name, address, background information - on the secure online site, TherapyAppointment.com. By completing the client information in advance, you will eliminate the need for paperwork at your first meeting, giving more time to get to talk, set treatment goals, and if time allows meet the herd. This first meeting will last about 1 hour. Feel free to contact Dr Bev if you would like to talk first for questions or clarifications before scheduling online.